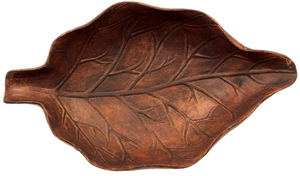 Specially designed to endure both indoor and outdoor use, and to fit with both indoor and outdoor decors, the Boca Grande ashtrays are artfully shaped from clay into the form of a curling tobacco leaf. and a big one at that. This model is the "Maduro" which is, as you might expect, the darker-finished of the two. The material is rather interesting; it looks like a ceramic, but feels like leather-hard clay. It's most likely a type of stoneware that will hold up nicely. See my comments for the blonde one.